Seven years ago I started the thesis which I am today releasing to the world. The past seven years have been hard. I have worked day and night, seven days a week for years. Spent hundreds of hours watching, clicking and reading creative projects; read tons and tons of books and research papers for lots of crazy fields throughout history; given so many presentations I’ve lost count; worked on lots of different creative (and research) projects with practitioners from new media, TV, film, gaming, print and so on. I could go on, and I know this probably sounds boring to you, but this has been my life for so long. Some people haven’t understood me. In the beginning many in my university department didn’t understand what the heck I was talking about. You want to do a thesis of what-media? I applied to the creative writing department, and they sent me to the media department. It’s about media, right, not writing. Hmmm. Others didn’t understand why I would do a PhD when I’m keen on pursuing my creative passions? Why on Earth would anyone do a PhD if they donâ€™t plan to work in academia? Itâ€™s like walking the Sahara before you write a book. Well, funny you should say that. I watched an interview with writer Paula Constant a few weeks ago (transcript, video). She wanted to be a writer. But before she wrote her first book she decided to walk across the Sahara. She needed to take that journey before she wrote. It was a perfect expression of who she is. A long road to a destination, but a path that is truly her own. This is where I think people who knock others, who claim that they can’t be X because they also do Y have never taken a risk themselves, have ever been courageous enough to be truly differentâ€¦indeed, to be themselves. One of the things Paula Constant said was that she had never completed something. I have completed things in the past, but nothing substantial. I wanted to do the PhD because I wanted to explore every aspect of a phenomenon I was passionate about. I wanted to research the past and present, I wanted to understand. I also wanted to train my mind to stay on one thing. Ha! At least I’ve learned to complete multiple things. But the training of the mind was important. I wanted to learn how to form an argument, to have knowledge that can be communicated in a sophisticated manner. I was very surprised by what I discovered. I entered academia being bewildered by big words. It frustrated me and so I understand when others are frustrated too. Why can’t they just say the same thing in accessible language? I’ll tell you why. Experts delve deep. Discussions in academia last for decades, centuries. It is amazing, you don’t just turn up and say this is what I think! You enter a rushing river in which people throughout time have been pondering the same thing. Over that time the discussions get more and more specific. Generalisations don’t work, and terms have years of significance behind them. This isn’t just in academia. Any area of specialisation leads to jargon. So, big words aren’t about being a wanker (though a small population are like that), they are about communicating a specific point. I also learned a lot about seeing something you create through to the end. I mean, this thesis has been in my life for years. I had to learn to keep going no matter what, to force myself to work. I’ve learned the easiest and most fun stage is definitely the wide exploration stage at the beginning. I’ve learned writing is research too. You discover things while you write. I learned that the hardest and darkest part of a major project is the final leg. This was for me in part due a significant death. In the last four years, all of my significant female elders have died: my maternal and paternal grandmothers, and most recently mother. I know most people donâ€™t have good relationships with their parents, and I know many are not brought up in loving environments, but I did and I was. My mother was an extraordinary woman and my only parent growing up. My life is less without her. In fact, while writing the thesis was the hardest thing I have done, the worst part was finishing it. It broke my heart to finish it because it meant the end of a chapter of my life that included my mum. Just putting it online makes the end of this chapter undeniable. She isnâ€™t here to be a part of it. It is the last leaf on the autumn tree. I remember when I was cleaning her blood out of the carpet (she hit the floor when she collapsed). I relished it because I could smell her, she still had a life-force of some kind, she was present. The heart-wrenching part was not cleaning her blood, but removing the last bit. Until there was no stain, nothing. Gone. Releasing the PhD is that last moment for me all over again. As long as my PhD is not released, Iâ€™m still in that world where I was struggling to finish it and she was there with me. 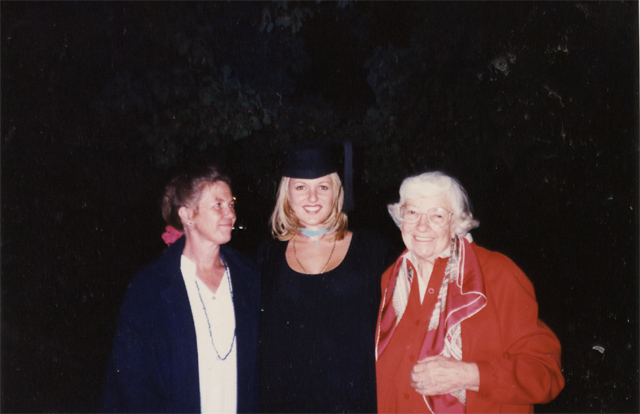 But she was there at my undergraduate ceremony, with my Granny too (see pic). And a couple of months before she died, she sent me a graduation gown for PhD ceremony. She was magically clever like that. Yes, now I have to leave that chapter of my life behind. She’ll be with me in other ways. I am actually lucky to have a gift to give to the world as part of this crossing-over. It isnâ€™t the thesis I thought I would write, it isnâ€™t the thesis I wanted to write, but it is what I decided to give at this point in time. It lovingly embraces the complex breadth of the area, and so most of you with it. It is in many ways a mirror of you all, the beauty I see in you. In the name of all who have created their own path, walked their own Sahara, and had the courage to follow their own star, I give you what is hopefully my first substantial gift to the world: my PhD. I just had to tell you that your story about how hard it is to let go of that last connection to your mother made me cry. I’m sitting here with tears streaming down my face. That was beautifully written, and I’m looking forward to digging into your thesis. Thank you so much for writing this. I’ve just started my own PhD and have similar creative goals; the only difference being that my PhD is in, what would appear at first, an utterly unrelated topic to the kinds of things I talk about writing. The jobs that people would expect me to go for are not the ones I ever consider doing and hardly any of the people I’m doing my inaugural year with appear to have any outside interests. I often get confused comments when I talk about my creative writing and the stuff I do with my drama group. I’m so sorry for your loss but congratulations on completing what looks to me like a Herculean task – one which I will have to begin tackling soon – even under such terrible circumstances. You’re a huge inspiration. Well done. Thank you thank you thank you. Thank for this gift, this letting go, and the sharing of the process that has got you to this point. It’s funny how your journey kind of mirrors my own Sahara. Three years ago I lost the last of my “elders” which left me feeling rootless and alone. To read about your mom made me cry… and remember. And to see your perseverance and sheer nerve in carving a path through uncharted territory is so…. I would say “encouraging”, but that’s too small a word for it. I guess it makes me feel like I’m not the only one who dreams things others don’t quite get. Thank you again, Christy. I so look forward to reading your thesis. Congratulations from the bottom of my heart, I have followed your work and I feel proud that you decided to make this move: close a chapter in your life and move on. I feel with you this moment in more ways that I can say. I see that you will be in the Netherlands soon, please contact me to meet! I lost my father while writing my PhD and even though he’d been ill for a couple of years it still came as a shock. Thanks for sharing your story and your work. Its a very generous act. And congratulations on your PhD. I love your answer to why a PhD is useful for a practitioner. The industry definitely needs more critical practitioners–people who are able to critically analyze their own practices and the environment that they work in. Academia also needs practitioners to engage in critical research in order for it to extend knowledge of the field in a meaningful way.